Lot et Garonne, as the name suggests, is home to the River Garonne, South West France’s most important river. Flowing from the Spanish central Pyrenees right into the Atlantic at Bordeaux via the Gironde estuary, this 602 km waterway is one of the few rivers in the world that has a tidal bore. As such it experiences surges of incoming tidal waves that travel up the river against the direction of the river’s natural current, often causing the water to change colour as it disturbs the sediment below. Boosted by the River Lot near Aiguillon, the Garonne has two other tributaries, the Dropt and the Baise. Together they flow through rolling hills and valleys with fertile pastures filled with peach trees, vast plum orchards and a host of vineyards producing Buzet, Pays de Duras and other Sauvignon and Merlot wines. Scores of sunflowers can be seen throughout the region which is also famous for foie gras, prunes, chocolate, la pomme d’amour (toffee apple) and, of course, the succulent Marmande tomatoes. This map shows the churches, museums, chateaux, historic places, places to visit and towns mentioned in the following area information. At the end of the page you will also find a link to take you to our Business Directory and What’s On pages. Click on this and you will find more information. Please note: These maps are for illustrative purposes only and are not to scale. Pruneaux are big business in Lot et Garonne and their picking needs to be timed to perfection and carried out quickly. A harvesting machine approaches the tree like a huge butterfly, spreading its wings under the branches and then, to the sound of 1000 woodpeckers working at once, it shakes the tree, collecting the fruit as it falls. The plums are then transported to the factory where they are cleansed and graded before being placed in huge ovens for drying to a fully dried or mi cuit (half cooked) stage. Some are stoned, some are packed as they are, others are filled with a prune cream and sold as pruneaux fourrés, and some are sent to a chocolatier where they are covered in dark chocolate. Once picked, the plum trees need to be prepared for the next harvest and this involves specially designed lopping machines which are driven between the rows of trees. Cutting both the sides and tops of the trees, they leave behind piles of wood and rows of pruned trees ready for next year’s growth. It’s a good job as the department accounts for 65% of France’s national prune production. Listed as one of France’s most beautiful villages, Monflanquin may have lost its ramparts after Louis X111 took the throne in 1610, but it has lost none of its’ historical charm. 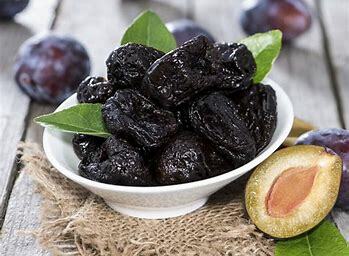 World famous for the quality of its’ Prunes, Agen is the prefecture of Lot et Garonne. Originally inhabited by the Nitiobriges people, it became a Roman district which developed into Aginnum, a booming city with its own amphitheatre on the hills above what is now Agen. The archaeological site, Villascopia, recreates a 4th century spa in Castelculier near Agen and uses 3D images to transform the ruins and depict the bathing rituals of the Gallo-Romans. In the times of Henry Plantagenet in 1154, Agen was a border town between the English and French and, up until 1370, it changed hands as many as 11 times. The Agenais, as they are still known, experienced a time of prosperity during the Renaissance, with Italian bishops bringing scholars and artists to the region. Around 1600 the town extended its reach to the 12th century church of St Caprais which became a Cathedral in 1802 and was classified as a historical monument in 1862. 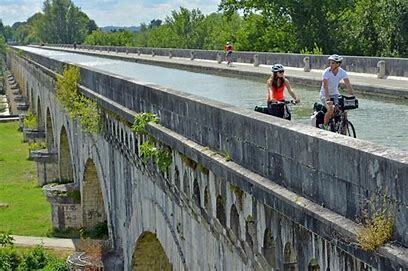 The Canal Lateral de la Garonne dates back to the mid-19th century and crosses the Garonne River in spectacular fashion on the Agen aqueduct, carrying barges and cyclists apparently sky high. Now awash with holidaymakers, the Canal is 193km long, has 53 locks and stretches from Castets en Dorthe all the way to Toulouse, where it joins the Canal du Midi. Housed in four Renaissance hotels, the Musée des Beaux-Arts is an interesting historical building in itself. Featuring archaeological and historical collections as well as fine art from as early as the 16th century, it also houses five of Goya’s paintings including The Balloon. The Canal Lateral de la Garonne dates back to the mid-19th century and crosses the Garonne River in spectacular fashion on the Agen aqueduct. The old part of Villeneuve sur Lot is flanked by the Porte de Pujols and the Porte de Paris. The old part of Villeneuve sur Lot is flanked by the Porte de Pujols and the Porte de Paris, two original defence positions from another bastide which was founded after the 11thcentury Albigensian crusade. Today, it is perhaps just as famous for Ste-Catherine, its’ neo-Romano-Byzantine, red-brick church. Designed by Corroyer in the late 1800’s, this eye-catching building has a tall octagonal belfry, is decorated with mosaics inside and has 23 stained-glass windows from the original Gothic church that stood in its place. Striking churches are a feature of Villeneuve as the town’s second, the Chapel of Notre Dame du Bout du Pont, is actually suspended over the river on the north side of the Pont Vieux bridge. Listed as one of France’s most beautiful villages, Monflanquin may have lost its ramparts after Louis X111 took the throne in 1610, but it has lost none of its’ historical charm. Founded in 1256 and combining medieval buildings and arcades with half-timber buildings and a flat bell-towered church, it also boasts the Maison du Prince Noir. This tall, square shaped building with arched windows is where King Edward III’s son, the Black Prince, stayed in the 14th century. Each August, the town holds a medieval festival with a procession of medieval costumes and knights during the day and a banquet in the evening. 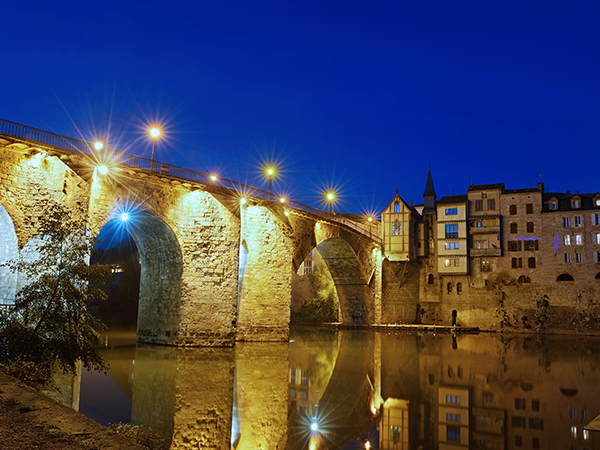 Founded by Alphonse de Poitiers in 1269, Villereal is close to the border with Dordogne and was intended to keep the English at bay during the Hundred Years War. It failed then and, if it wanted to keep visitors away, it certainly fails today. The village is a delight with half-timbered buildings, ancient moats and the, oddly enough, the old Leper House. Lot et Garonne is home to many interesting chateaux such as the Chateau de Duras, Chateau de Bonaguil and Chateau Gavaudun. Other bastide towns include Villereal, Pujols, Tournon-d’Agenais and, amongst others, Puymirol. Churches reveal many a surprise with the Church of St Vincent at Mas d’Agenais holding Rembrandt’s Christ on the Cross and, in Pujols, the 15th century Ste-Foy-La-Jeune which now exhibits treasures such as the Martyrdom of St Faith mural. You will find a wide selection of other tourist spots, churches, hotels and events in our Business Directory and What’s On pages. Why not take a look, you can search under category type, town or region. 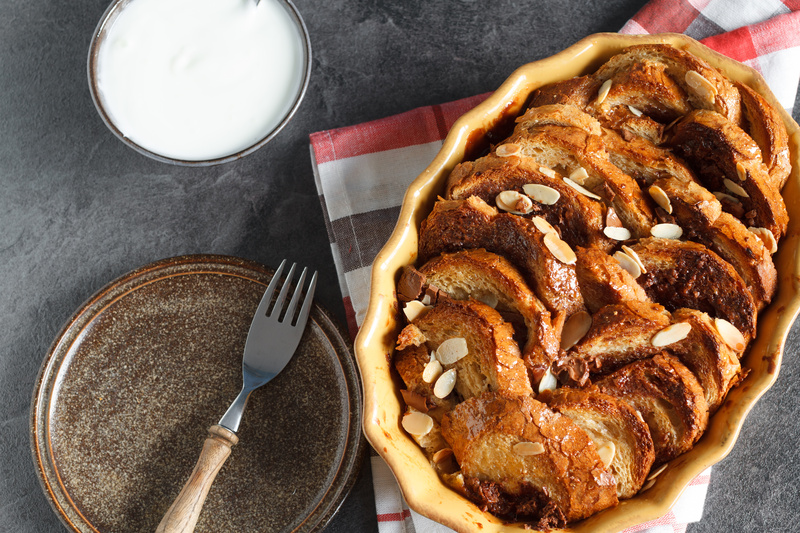 Chocolate bread & butter pudding – a naughty treat! It wouldn’t be right if it didn’t contain a glug of Armagnac – but you are making your version, so you decide. – Grease a 9” baking dish and add slices of french bread to completely fill it. – Mix ¾ pint milk with half pint cream and add sugar to taste. – Add two grated 100g bars of 75% cocoa solid chocolate and 4 tbsp of cocoa powder. Mix well. – Add six whisked eggs. Mix well again and pour over the bread, making sure that every bit is covered. Push the bread down into the milk. – Slice each prune in half and push each half down into the bread. Cook at 180°C until set and browned. If it starts to brown too quickly, cover with a piece of kitchen foil. Serve with cream or ice cream.